It all began here in Monroe County, the opening up of the western frontier in Eastern Tennessee in 1756 and the opening to a doorway to the sky in 1996. Monroe County is ideally located in both the western Blue Ridge Mountains and the Great Tennessee River Valley just southwest of Knoxville Tennessee, and about an hours drive from Chattanooga Tennessee. One third of the county is occupied by the Cherokee National Forest with 189 miles of trails available for hiking, horseback riding and mountain biking. Scenic drives, fishing and camping draws visitors to its high mountain reaches and deep open valley. Monroe County’s neighbor to the northeast is the Great Smoky Mountain National Park. The best of both worlds describes Monroe County; the tranquil river valley of eastern Tennessee is dotted with small family farms, a variety of local business and a history rich in Early American settlements and Native American heritage. This popular region of southeastern Tennessee is part of what’s referred to as the Tennessee Overhill Country. Before the influx of early settlers this was the land of the Cherokee People. Western Monroe County with its rivers, creeks and farmlands was ideal for its early inhabitants. The mountains in the eastern part of the county were a wealth of resources and game. The Cherokee were highly organized people, spreading themselves throughout the heart of the southeastern United States; they lived in established towns in home structures and were not nomadic village tribes always on the move. Once the Cherokee people began trading furs and hides with the Europeans they became dependent on their goods and started to assimilate with the newly arrived white settlers. The Cherokee People advanced their society thru the genius of Sequoyah (1776-1843.) His father was a fur trader his mother the daughter of a Cherokee Chief. Without any formal training Sequoyah perfected a system for a written Cherokee language referred to as the “Syllabary” or the Cherokee Alphabet so that the Cherokee Nation would live forever. His birthplace was at the outlying village of Tuskegee not far from the Sequoyah Birthplace Museum near the present day town of Vonore in Monroe County. The museum tells the history of the Overhill Cherokee, their daily lives, beliefs and customs as well as the dark days of the Trail of Tears. Monroe County is part of three counties in southeastern Tennessee located in and along the western wall of the Blue Ridge Mountains. This area has been known from earliest times as the Cherokee Overhill Country known today mostly as the Tennessee Overhill. Though the Cherokee people lived throughout the Blue Ridge Mountains, main bands of Cherokee lived in the valley, mountains, and piedmont lands of the Carolina’s to the east, North Georgia to the south and the Tennessee River Valley region to the west. In order for the eastern settlements to reach the western settlements 24 steep mountains would have to be crossed. As early as 1746 the British who allied themselves with the Cherokee People saw a need for a fort in the far western Overhill region. A fort was proposed to consolidate their relationship with the Cherokee and block further penetration of the French who had fur-trading operations along the Mississippi River. The British Independent Company of South Carolina began construction of Fort Loudoun in 1756, at a point were the Little Tennessee River emerges from the mountains in the present day town of Vonore. The purpose of the fort became essential in order to aid and protect the Cherokee in what was known as the French and Indian War. A turn of events between the Cherokee and the British in another part of the Cherokee Nation caused relationships between the Overhill Cherokee and the British at Fort Loudoun to break down. An uprising by the Cherokee brought about the surrender of Fort Loudoun in 1760 just four years later. With great effort a thorough archaeological study was conducted at the site. A fort representing the exact original fort has been reconstructed at Fort Loudoun Historic Area. The opened gates of the reconstructed fort welcome visitors to leisurely stroll about the grounds and examine this unique archaeological site. The museum within the welcome center depicts the history and reconstruction of the fort, along with artifacts and an informative video presentation, which we highly recommend. Scheduled events and reenactments are held throughout the year and once a month the Garrison Weekends Group presents a portrayal of early life at Fort Loudoun. Fort Loudoun Historic Area is open free to the public with the exception of special events and re-enactments. Conveniently located across the road from the entrance to Fort Loudoun is the Sequoyah Birthplace Museum a great location to witness the life and times of these two cultures. With rugged mountains in the eastern section of the county the most sensible place to establish communities in Monroe County were the valley lands. Towns like Madisonville, Vonore, Tellico Plains and Coker Creek lie within the foothills just outside the mountains. These communities represent that down home country style so categorized with rural America. Small farms and businesses along with textiles companies and the tourist trade make up the financial backbone of Monroe County. The town of Sweetwater lies on the western edge of the county along the Interstate 75 corridor. 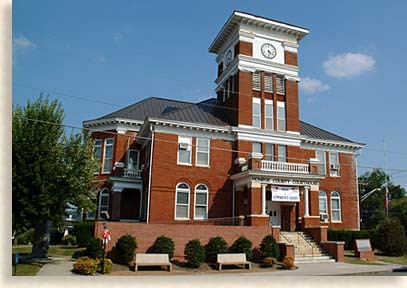 The county seat of Monroe County is Madisonville, at the center of the town sets the historic county courthouse. Built in 1892 the courthouse on the square is the oldest courthouse in the Overhill region. The coming of the railroad rolled through Madisonville giving rise to the towns wealth and growth. This sizable town on highway 411 offers shopping, dining and lodging along with century old architecture and a sense of hometown living. Following highway 411 to the north of Madisonville is the town of Vonore. Here you’ll find an abundance of history starting with the Vonore Heritage Museum defining the life of early settlement in what would become Monroe County. Located on the eastern edge of the town of Vonore is the Sequoyah Birthplace Museum and Fort Loudoun Historic Site, both sites are located on an island accessible by road across land bridges. The beautiful and popular recreation waters of Tellico Lake surround the island; the lake was created after the damming of the Little Tennessee River. Boating, fishing and swimming in the crystal blue waters of Tellico Lake along with camping; hiking and picnicking along its shores draw visitors to this beautiful lake each year. For motorcycle enthusiast, Vonore is the gateway to one of the most popular cycling route in the country, the only place in North America where you can metaphorically catch the Dragon by the Tail. From Vonore take highway 72 along the north bank of the Little Tennessee River to Calderwood and pick up highway 129. Calderwood is where the Tail of the Dragon begins its twisting and winding 11-mile stretch of road deep within the Cherokee National Forest offering a challenging 318 unique turns as it climbs the mountain slope skirting the southern edge of the Great Smoky Mountain National Park. 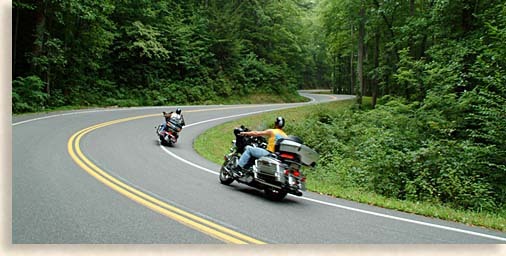 The Tail of the Dragon crosses over Deals Gap at the Tennessee North Carolina border ending the 318 curve run, but the curves don’t stop there, entering the steep mountains country of North Carolina you can keep going and going. At the far southeastern corner of the county in the rugged foothills of the mountains, gold fever struck Monroe County in the Coker Creek region. This fairly remote region was overrun with gold seeks in 1831. The gold rush was on in several locations throughout the Blue Ridge Mountains during this time. This was still the land of the Cherokee People during this rush for gold and the governments reasoning for the Native American Removal from the region sadly known as the Trail of Tears. Thousands of natural Americans were rounded up and forced to the Oklahoma Territory, thousand died due to the forced removal. Many of the Cherokee People though escaped deep into the mountains of North Carolina and into the remote southern base of the Smoky Mountains. Since the days of the gold rush the area hasn’t changed much in the last 175-plus years except that most roads are paved and electricity has been available to the region since the mid 20th Century. If you do have a taste for gold you can still pan for gold in the region, experienced gold seeks know how and where to look yellow stone. If you enjoy hiking and looking for a little solitude from the outer world the tumbling waters of Coker Creek and the Coker Creek Falls will reward your effort. The community of Coker Creek is on highway 68 just south of Tellico Plains. Tellico Plains on highway 68 is the doorway to the mountains or rather the doorway to the sky. Just below the high peaks of the Unicoi Mountains along the banks of the Tellico River is the town of Tellico Plains. This was once the site of a significant Cherokee town, a natural trade center on an ancient trading route thru the Unicoi Mountain Wilderness. 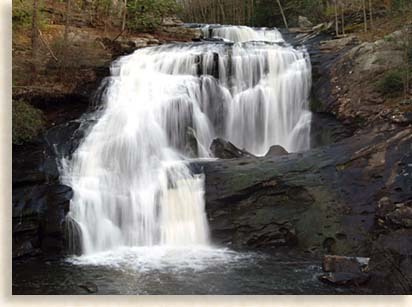 At the turn of the century Tellico Plains was used a as a headquarters for a logging camp. Today this quaint little town serves as a tourist center with shops, dining and lodging located in and around its historic area including two museums. The Charles Hall Museum depicts the local history of the area and the Cherohala Skyway Visitor Center tells the story of engineering feat of a scenic highway. The scenic Cherohala Skyway along the Tellico River and over the Unaka Mountains (also called the Unicoi Mountains) is the crown jewels of Monroe County. Going east from Tellico Plains on highway 168 you can follow along the banks of the Tellico River. This picturesque river is a favorite for fishermen and fisher-women alike, canoeist run the watercourse regularly and if you own your own raft or a rubber tub the broad waters of the Tellico River are less intimidating than the wild Ocoee. This broad river winds along the highway until it reaches the juncture were the river and the road narrows, the road to the right is River Road, which follows the course of the river up thru the Tellico River Gorge. Following this narrow paved road takes you into the deep carved beauty of a white water gorge, a scenic route that a must see for all visitors to Monroe County. 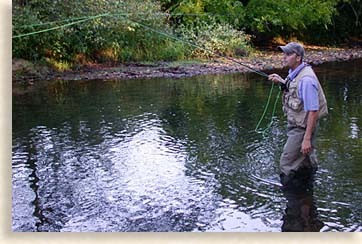 The sheer rock walls and rushing whitewater is laced with scatter sightseers and fishing enthusiast. The pay off for this journey is when you arrive at Bald River Falls one of the most outstanding waterfalls in eastern Tennessee and visible for the road, the view from the bridge is a photo opportunity rarely witnessed. Back on highway 165 at the mouth of the river gorge you leave the Tellico River behind and begin an ascent onto one of the most spectacular drives and newest scenic routes in the Blue Ridge Mountains. The Cherohala Skyway is roughly fifty-one mile long highway that climbs to an elevation peak of 5,390 and is considered to rival the highly renowned Blue Ridge Parkway in engineering and beautiful scenic overlooks. Opened to the public in 1996 this route was created to connect Tellico Plains in the Tennessee Valley foothills to the remote mountain town of Robbinsville North Carolina. The highway originally followed parts of an ancient Native American trading route and later became a wagon route that was used as an annual wagon train route for the Tellico Plains Kiwanis Club since 1958. The Kiwanis Club members used the route to publicize the need for a highway across the rugged and remote Unaka (Unicoi) Mountains. It took 30 years to build the new highway at a cost of 100 million dollars. Travelers on the Cherohala Skyway will enjoy spectacular scenery with marked hiking and mountain biking trails that will take you into the solitude of this remote mountain wilderness. Its helpful to pickup a brochure guide to accompany your trip, guides are available at the Visitor's Center and at most any commercial businesses servicing tourism visitors. At the end of the Cherohala Skyway in North Carolina you can witness first hand a preserve of old growth forest that is rarely seen in these mountain due to heavy logging in the late 19th and early 20th century. The Joyce Kilmer Memorial Forest with some trees 20 feet around the base are well over 150 feet tall, some of these giants are 400 years old. The loop trail won’t take long it’s fairly moderate to hike. After leaving Joyce Kilmer Memorial Forest you’ll want to head back over the Cherohala Skyway the same way you came and enjoy a whole different view of the scenic skyway on your journey back to Monroe County. If your looking to get away from it all and are seeking a quiet corner of the world were beautiful mountains and rivers coincide with lands of valley farms and communities rich in history, along with all the excitement of a world of outdoor wonders Monroe County in southeastern Tennessee is where you’ll want to visit next and return again and again.